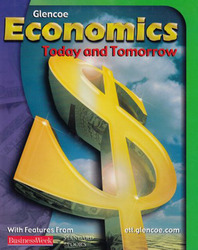 This updated 2005 copyright of Economics Today & Tomorrow includes information on the economic impact of September 11, 2001. The diagrams, charts, photos, and illustrations have all been updated. Help students “read to learn” with a unique reading comprehension strand that fosters active reading and provides extensive help with the vocabulary of economics. Enable your students to better study with a Foldables™ ancillary. Foldables activities are also featured in the Teacher Wraparound Edition.